With two large costs looming on the horizon, you and your partner need to sit down and decide if one takes priority over the other. If it's the house, then plan for a smaller wedding or a nuptial celebration later on down the road. 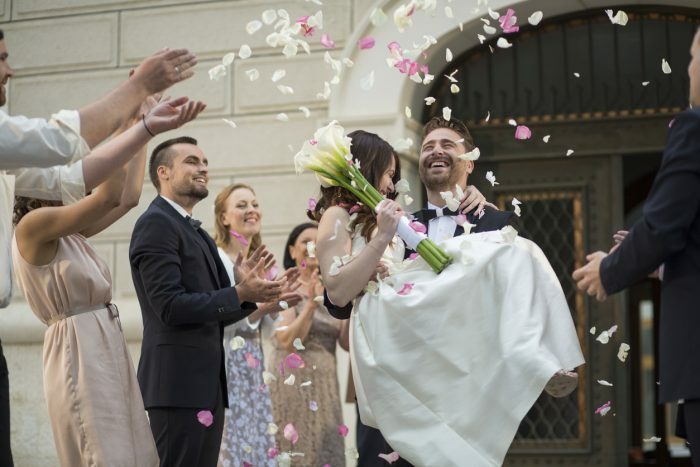 "I've worked with a lot of couples who have saved for both, and it's because one partner wants the wedding and the other partner wants the house," says Kristin Carleton, a financial advisor with Towne Investment Group. "When you have one partner who really plans for the house and the other who is planning for the wedding, you end up trying to do both at the same time. "You generally have to make a choice," Carleton adds. "It's very difficult to save for a big wedding and a large down payment at the same time." "Part of that process should be talking to a mortgage broker or banker to find out what program you can fit into and how much of a down payment you want to put down on a house," says Carleton. "Otherwise, you are hiring the florist for the wedding and you go way over budget because you see an account with $20,000," says Carleton. "I suggest that couples set up a direct deposit program straight from their paychecks before they have a chance to spend it." Separate accounts will ensure that you and your partner are saving money consistently from month to month. Unlike a down payment, which is a one-time expense, a wedding requires lots of smaller expenses that add up quickly—everything from the dress to the catering fees to the wedding rings. Giving your wedding its own savings account allows you to keep an eye on how much you've spent so far. Your budget is going to determine your timeline for your wedding date and house purchase. Be realistic and break your goal down month by month to figure out a workable timeline. Don't set a high number and expect to get to it without a reasonable plan. For example, if you need to save $60,000 and you can put away $2,000 a month, it will take two-and-a-half years to hit your goal. Carleton also advises factoring in several additional months of saving, just in case hidden expenses pop up along the way. "This is a really good exercise for couples to start communicating frequently," says Carleton. In other words, it's perfect practice for marriage. "It's a good way to set goals and see how you do working towards a big goal," Carleton adds. Carleton advises scheduling monthly check-ins with your partner to look at your financial progress. She also suggests meeting with a financial advisor each quarter to make sure you are on track. "I think a financial planner is the best person to keep you accountable during this time," she says. Finding a financial advisor who can work closely with your mortgage broker is also important for problem-solving when you're ready to purchase a home. "The last thing I would say in terms of keeping people accountable is to make sure that you are on the same page," says Carleton. "I think it's important that each person gets spending money built into the budget. Spend it with no questions asked, and make sure your budget is realistic." Marissa Hermanson is a wedding and lifestyle writer who has been published by The Knot and Southern Living. She currently writes on behalf of Larson Jewelers, an online jeweler offering unique and affordable men's wedding rings that will fit your budget. Yes, I totally agree with you. I think that it is better that we are hands on about planning and setting up a budget for everything so that we avoid problems in the future. Thanks for sharing this article. Thanks for sharing this article. I totally agree with you.